After making the Japanese vegan soy sauce concentrate from Elizabeth Andoh’s new Kansha cookbook , I tried using it to concoct a vegetarian version of the basic Vietnamese fish sauce dipping sauce. 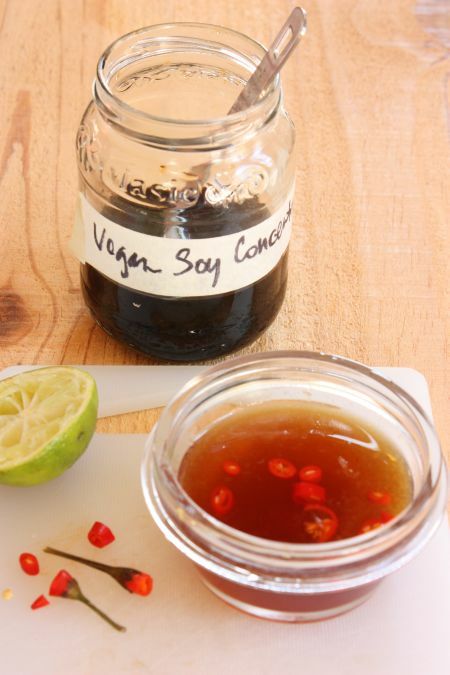 Right off the bat, I realized that I could just dilute the vegan soy concentrate to make a vegetarian fish sauce. 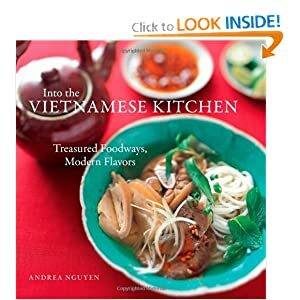 It was dull tasting, like the bottled veggie nuoc mam that I discussed a while back. I had to doctor up the soy concentrate to best utilize its umami-ness without letting its soy sauce flavor become too pronounced. Given that, I aimed for a fish sauce-less alternative to nuoc cham, the ubiquitous dipping sauce served with rice paper rolls (goi cuon), bun rice noodle bowls, etc. What I came up with looked like a dark version of the basic nuoc cham dipping sauce but wasn’t as punchy. That is just fine because Vietnamese vegetarian food has a light flavor profile. I’ve had similar dipping sauces that were much lighter in flavor and color. To test the vegetarian fish sauce dipping sauce out, I dipped a few raw herb leaves into it and tasted. It was quite serviceable. Then I tried out the sauce on my skeptical husband, Rory. We had an impromptu lunch of bun rice noodle bowls and I served the sauce. It worked well, Rory said, and then he shot some regular fish sauce into this noodle bowl. It didn’t quite taste right – mixing the nuoc mam with the soy sauce concentrate. The lesson there is that you’re better off adding more of the soy concentrate to the dipping sauce and creating something dark in color. I’m not about to turn into a vegetarian, but Elizabeth’s Japanese soy concentrate has certainly broadened my culinary vista. The recipe below is for you to experiment with. The reason why this recipe yields a small quantity is because if you make a smaller amount first, you can tinker with it easier. When you’re satisfied with your ‘formula,’ triple or quadruple the sauce to make enough for a meal. In a small bowl, stir together the lime juice, sugar, water, and soy concentrate. Taste and adjust the flavor for a balance of tart sweet and savory. Don’t expect huge flavors, but rather a pleasant finish. After you are satisfied, add the chile. Set the sauce aside for about 10 minutes to allow the chile to add its spice note. Then serve. Try this recipe out and let me know your tweaks!